Note from September 16, 2013 - Over the weekend, I listened to this poem in my head many times and decided that 'September' would sound better in the last line than 'October'. I made this change in the written text but not in the recording. Which do you like better? Why? Students - I am getting back into my notebook, making a more regular writing schedule. You may be doing this too as school is just starting near where I live. Some of you have been in school for a month or more, and those of you who live across the world from me in Buffalo, NY...you are not near summer at all! I do always find this so neat to think about. Getting back to a writing time feels so good to me, like a change of seasons on my insides. And I'm noticing the change of seasons outside too. This week I have been home much more than lately, and I keep hearing a certain sound. That's the sound of an acorn plunking onto our big metal mailbox, and it's the music outside my writing window this week. 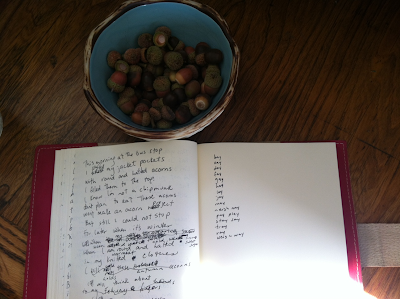 On Wednesday morning, waiting with our children at the bus stop, I picked a bowl full of acorns to bring inside. Just to have. I will glue their tops back on this weekend. (At first, part of me felt guilty about gathering so many acorns because I thought I should "leave them for the squirrels and chipmunks." The reality is that we have almost no squirrels here in the country, and the chipmunks have been scared permanently underground or elsewhere by our five cats. Remembering this, my worries disappeared. Here at Mass Audubon you can read some interesting information about oak trees and acorns and how they grow. You can read about mast years at AccuWeather too. Teachers and Parents - here at yoga set free is a beautiful post I read about a mast year last year - and what exactly so much abundance can mean to all of us. This week's Poetry Friday roundup is hosted by Jen over at Teach Mentor Texts. There you will find many connections, links, poems, poetry thoughts, and wonderful people too... We all welcome you to join us for poetry fun each and every Poetry Friday throughout the year. See my sidebar - or any participant's sidebar - to learn where to find us each week. If you have not yet visited Dan Bailey's music notebooks at my notebooks blog, Sharing Our Notebooks, you still have three days to enjoy that peek as well as enter to win a beautiful musical notebook. Speaking of acorns, I was reading a novel about WW II and due to a shortage of coffee, people made due with coffee concocted of chicory and acorns! I remember biting into an acorn when I was young and feeling my tongue go numb! I can't image acorn coffee! GAH! "When I am round and hatted in my warmest knitted clothes" - so wonderful and surprising. There is a lot to love in this poem, and in acorns. 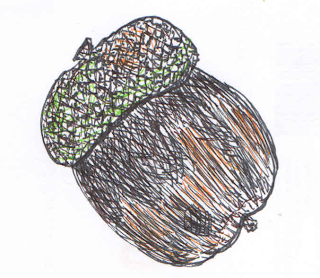 The acorns are different in Italy, longer and thinner and with smaller hats. I sometimes miss the plump ones with their jaunty berets. Thank you for this lovely reminder, Amy! Amy, I have loads of trees around my home but no oaks here! Some of the leaves are turning and falling, and I'm already picking up the beauties (as if I really needed more leaves!). 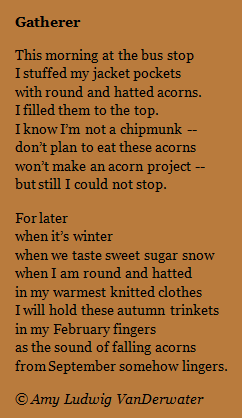 I love this, especially that last rhyme, "my February fingers...from October somehow lingers." It does help to remember, doesn't it, when the trees are bare and snow covers? Thanks, beautiful! Growing up here in New England, I can so identify with this! My 3-year-old loves collecting acorns...although he still confuses the words 'acorn,' 'popcorn,' and 'corn on the cob.' He's always getting them wrong, but fortunately we always know what he means! Wonderful, Amy! I'm a huge picker upper of acorns and pine cones. Even in Florida, we have acorns from the live oaks and collecting them is a nice reminder of my home, New England! Love this poem, especially the last four lines. We have lots of acorns here which the deer and squirrels feast upon. "round and hatted" is just too adorable. Your poems always delight me. Thanks for the peek into your notebook, too, as well as in your pockets. Acorns haven't started falling here in the deep south yet. The air is still 100 degrees. But it will happen soon and I will think of your poem. Just today, as I was washing down my kids' desks at the end of the day, I discovered a little baggie filled with acorns tucked into the corner of one. Perhaps one of my kiddos was thinking about "February fingers", too?! This is a gem, Amy!! Recently my mom was showing me an oak seedling on their property -- a buried acorn that had been forgotten. It was not the only one...she said that about half of the squirrels' stash is left underground! Yes, I love your poem, but I have just gotten completely lost in the explanations of "mast years." That acorns are made on a TWO year schedule?!? That our oaks are somehow chatting with yours and with the weather to create this abundance?!?! My head is spinning. There is simply so much we don't know or understand. Humbling. Positively humbling. I love the comparison of the "round and hatted" narrator to the similarly shaped and covered acorn. What a perfect image! I love gathering acorns and now I know why! I love "autumn trinkets"!!! They really are.